Yes, we provide a free estimate, although, in our world, we refer to that as a project investment window. Many people use the term estimate in lieu of final price or cost. When pricing a custom project, a true comprehensive fixed price contract can only be obtained once a finished plan has been designed, exact materials to be used have been specified, and the labor involved to complete the work proposed has been calculated. How much does it cost to remodel? There are three main variables that collectively determine the final cost of a project: The size of the room or space to be remodeled, scope of work (how involved the project will be), and the amount and quality of product that is selected. While the size of the space remains constant, many adjustments can be made to the other two areas. We recommend that you schedule your complimentary in showroom consultation with one of our skilled designers so that we help you define the parameters of your project, only then can we honestly propose an investment that is realistic for your project. In the meantime, Remodeling Magazine publishes their cost vs. value report that collects regional data from homeowners of completed remodeling projects. This could be used to establish a bench mark for your proposed project. Premier has created a proven process that guides our clients from our initial meeting to the final walk-through. Please follow the link to read in-depth more about our process. Premier Kitchen and Bath offers an industry leading 5-year warranty on labor. Do I pay more for a design/build firm? No. Pulling together a full kitchen or bathroom remodel is an arduous task, even for the trained professional. If you decide to hire the individual trades and manage the product vendors and project trades, don’t under estimate the amount of time and coordination that is needed. There are between six and eight different trades that are needed in a kitchen or bathroom remodel! Often people find that the project took twice as long and cost nearly as much. Not to mention the STRESS factor. Having the designers, all the trades, and project management within one company can be priceless. Many factors play into determining the longevity of a project. A kitchen remodel may be as straight forward as new cabinets and countertops or can be as involved as relocating interior walls, plumbing, and electrical circuits. Since each project varies greatly in size, complexity, and jobsite conditions, it is best to have one of our trained remodeling professionals assess your distinct project requirements to give you a realistic time frame. If you are so inclined to do some of the work yourself, please limit these activities to demolition and possibly painting. Unless you are active in the trades, having your brother’s friend do the electrical is NOT a good idea. Besides breaking up the continuity of the scheduling, it will be your responsibility if problems are discovered later on. Not to mention the next family gathering where things can get a little awkward. Premier kitchen and Bath employs a full staff of experienced craftsman that are under the direct supervision of our project Manager. This in-house control has enabled us to deliver superior quality and customer service throughout the remodeling process. Can we provide materials for you to install for the project? Premier offers an industry leading 5-year comprehensive warranty on all of their completed projects. The material incorporated into the project is integral to the longevity of the project as a whole. Premier has access to most products but must procure and install the material in order to extend this warranty. Do you provide a construction schedule at the start of the project? Yes. Our Project Manager will create and share a calendar of the project timeline with you prior to the start of your project. Do you provide full services? Yes. Premier employees degreed designers, administrative staff, Project Managers, and seasoned professional tradesmen that can take your project from concept to completion. Do you provide free design and ideas or is there a cost involved? During our complimentary consultation, we will learn about you and your family’s lifestyle, priorities, and investment parameters for the project. Only then can we effectively share our thoughts with you regarding your space and proposed project. If upon conclusion of our meeting we both agree that we are a good fit for each other, we will take the next step, a Design Agreement, that does require a small deposit that will vary based on the project size and scope. From there the design process begins with a visit to the home for sketches, measurement and pictures. Our designers will need to invest significant resources and time into creating a design unique to you. In addition, we will produce a comprehensive written scope of work and product list that are needed to produce your project. Premier applies this Design Agreement Deposit toward the cost of the project. Our project agreements require a deposit and milestone progress payments based on the particular scope of work. Do your installers speak English? Yes. All of our crew leaders communicate in English. Do we receive a project cost breakdown? Premier Kitchen and Bath is a project based firm. This means that our aggregate cost of design, products, mobilization, construction, clean-up, etc. are pooled and totaled. The many facets of a project are so intertwined with each other that they cannot be separated. How can you give me a budget/estimate without coming to the house? Premier has been remodeling kitchens and bathrooms in the greater Phoenix area for over 20 years. 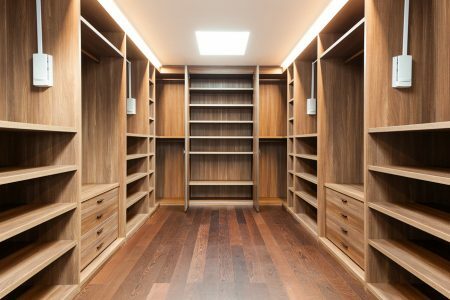 It is likely we have encountered your particular home style, size, or project requirements before. Our designers alone have a combined 75 years of experience. After a discovery meeting (complimentary in-showroom consultation) in which we narrow down some of the variables, it is with confidence we are able to establish a realistic investment window. 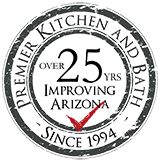 What kinds of projects has Premier Kitchen and Bath completed? Premier has worked in some of the finest residences and properties throughout the Phoenix metropolitan area. Our projects cover a broad range, from simple installs to complex renovations in the kitchen and bath arena as well as whole house remodels. We are also equipped and licensed for home additions. View the gallery to get a feel for our quality of work or visit the Premier showroom to see more. Do you only remodel kitchen and bathrooms? We have a great depth of experience in kitchens and bathrooms, large and small. But, with our cumulative 150+ years’ experience in the remodeling industry, we have also designed, supplied, constructed, and installed for virtually every other type of residential remodel project. It is not uncommon for us to remodel an entire home’s interior including the kitchen, bathrooms, flooring, fireplace, entertainment center, windows and doors or opening up living spaces. What is the benefit of Premier Kitchen and Bath’s one-stop approach? Remodeling is an involved process, but our one-stop approach simplifies things dramatically for the homeowner, eliminating the hassles, while saving time and money and ensuring a cohesive project design and installation. Because every aspect of the project is planned for simultaneously everything progresses and comes together smoothly as a well-oiled machine – It’s a business model that few companies have adopted, but a process Premier has perfected. The “Red Carpet” remodeling process, that we offer, provides clients a smooth, stress-free, and enjoyable remodeling experience. Please feel free to call or visit our showroom where you will be greeted by one of our friendly, talented, highly qualified members of the Premier design team to begin the process. We look forward to the opportunity. Call us today to see how hassle-free and enjoyable your remodel project can be.